Pop, Clink, Fizz! 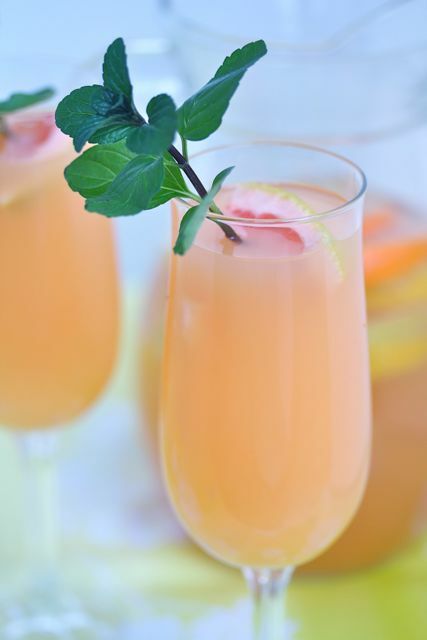 It's the weekend and I've got a sparkling citrus sangria for you to try. As some of you may know, I have a slight love for grapefruit. I think it's safe to say it's my favorite fruit and I'm confident that grapefruit season keeps my winter blues away! This weekend will be pretty low key for us which I don't mind one bit. It's been raining all week so I'm looking forward to some sunshine and getting more work done in the garden. I need to mulch the flower beds and throw in a few lingering tulip bulbs that never got planted this fall. (Oops!) I also got some new window treatments for our living room so I plan on throwing a few winks at Daniel tonight in hopes that he'll help me hang them tomorrow. 1. Mix Riesling wine, grapefruit juice, orange liquor and citrus slices. Refrigerate for at least 2 hours. 2. At time of service, mix in champagne and stir. 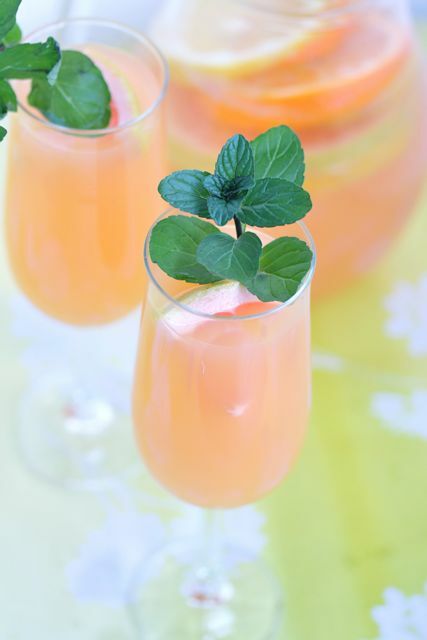 Pour sangria and garnish with fresh citrus slice and a sprig of mint. nice to meet u really love ur post..I want to drink it...looks delicious!! Oh yum! I love sangria. Definitely trying this. Now this is a perfect cocktail! Gorgeous. I am going to serve this at my friend's baby shower. Did you use fresh squeezed grapefruit juice? This is perfect for a baby shower! You could use either. I believe I used fresh since they were in season at the time I posted this. However, my favorite brand of grapefruit juice is Indian River, if you choose to go that route.